The seven gods of Order had ruled unchallenged for centuries, served by the adepts of the Circle in their bleak northern castle on the Star Peninsula. But for Tarod—the most enigmatic and formidable sorcerer in the Circle’s ranks—a darker affinity had begun to call. Threatening his beliefs, even his sanity, it rose unbidden from beyond time; an ancient and deadly adversary that could plunge the world into madness and chaos—and whose power might rival that of the gods themselves. Tarod has returned! After a long absence from the bookshops, the TIME MASTER TRILOGY is now re-published by MUNDANIA PRESS! Vol. 1, The Initiate and vol. 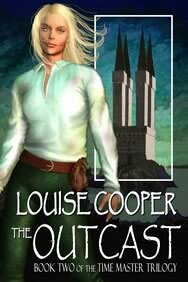 2, The Outcastare available now, and the climactic vol. 3, The Master is coming soon. 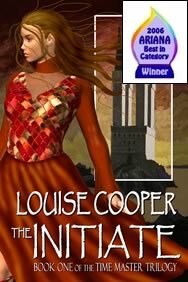 They've already made a splash, as Mundania's cover for The Initiate won the Ariana 'Best In Category' award in 2006—a double delight for me, because my husband. Cas, is co-artist along with Stacey King. The books are published in hardcover, trade paperback and eBook formats. 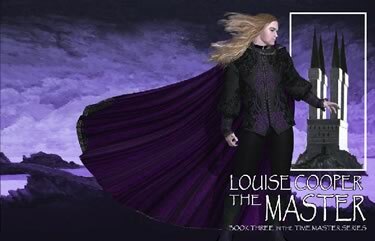 There are also special SIGNED LIMITED EDITION hardcover editions—and as if that wasn't enough to choose from, The Initiate is also available as an unabridged audio book, in a variety of formats. You can buy them direct through Mundania's own web site, www.mundania.com, or through all good Internet outlets. And if you prefer to go to a bookshop, your local store should be able to order them without any problem. But that's not all – because there's a SPECIAL BONUS for readers who buy copies of any of the Time Master volumes direct from Mundania. I've written a short story especially to accompany each book, and the stories will be sent FREE as a PDF download to everyone who buys the accompanying title.